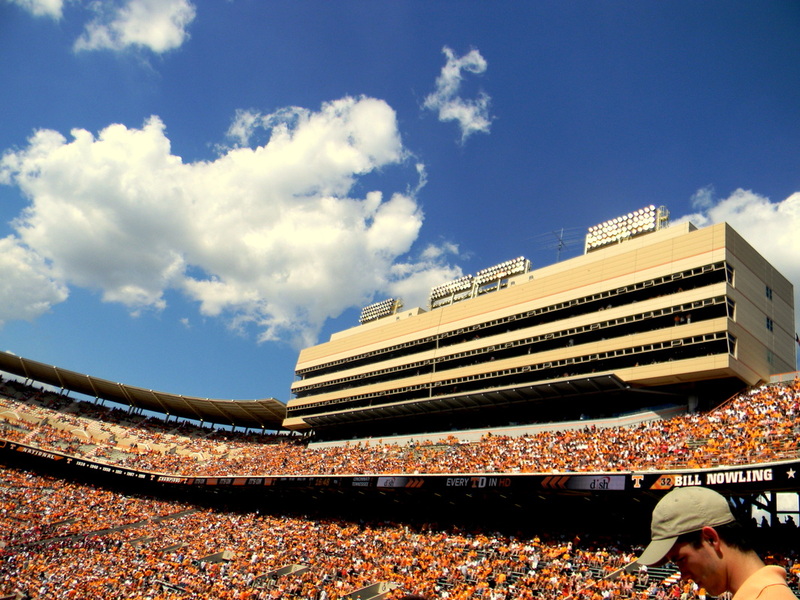 Stadium Features: Neyland stadium has two tiers, wrapped around the stadium with no openings. This gives you a great view of the "sea of orange" from any seat. The stadium has gone under recent renovations including the Tennessee terrace and the west club. A new HD board was also added to the south endzone of the stadium. The locker room was also renovated named after Peyton Manning. The concourse is very tight on the ends of the stadium but it keeps the older feel of the stadium. The main concourse looks renovated and is much wider. The team shop is located near gate 20. You will find a wide selection of vols gear here. The checker end zone is a staple of the stadium, gives the field a real unique feature. The upper portion of the stadium provides chairback seating. The north side of the stadium will give you a nice view of the HD board. Traditions: The Vol Walk happens a few hours before the game, the band and fans align to form a walk way for the players to walk through to enter the stadium. The Power T can be seen everywhere around the campus. Rocky Top the unofficial fight song. When you attend a game expect to hear it at least 25 times. The checker end zone is a Staple of Neyland Stadium, it is extremely unique and a great feature. Down Volunteer Landing near the river you'll find the Vol Navy, this is quite a scene.The bigger the game more boats will be on the water. Top half of Neyland Stadium. Knoxville is the third largest city in Tennessee. Population around 185,000. 1. Volunteer landing is where you can find the Vol Navy, it sets on the Tennessee River. The walkway has plenty of water features and is a great place for pictures. At the end of the walk you'll find Calhoun's on the river. Pretty good food but get there early on game days if you plan on eating. 2. If you are staying in the downtown area make sure you check out the downtown area of Knoxville. Market Square is a beautiful open area filled with plenty of restaurants and live entertainment. Gay St also has great food such as the Downtown Grill and Brewery. Make sure to stop by the Mast General Store, when you walk in you'll fell like you are in the old south. If you are in town early you can visit the Movie Theater located on Gay Street which is top notch. For the 21 and older crowd take a look at the old city. The old city has plenty of bars and restaurants in the vicinity. 3. The Vol Walk is a must see. The team walks down Peyton Manning and heads into the stadium. Be ready to sing Rocky Top at the top of your lungs as the band plays it loud and proud. Before the Vol Walk take a walk around the campus and see one of the biggest tailgates in the nation. 4. The UT Strip located on Cumberland Avenue is full of bars, restaurants, and bookstores. This is also a destination for fast food. They have several bookstores to visit. The official bookstore is located in the University center. You can also find fast food here. 5. Head to Neyland Stadium!